Sharing one of my go-to weeknight dinners. We love this one because it is super quick and easy; it hardly even requires any chopping, the sauce has exactly two ingredients, and we just buy frozen battered fish that we love. Since it’s so easy and yummy it’s part of our monthly meal rotation. 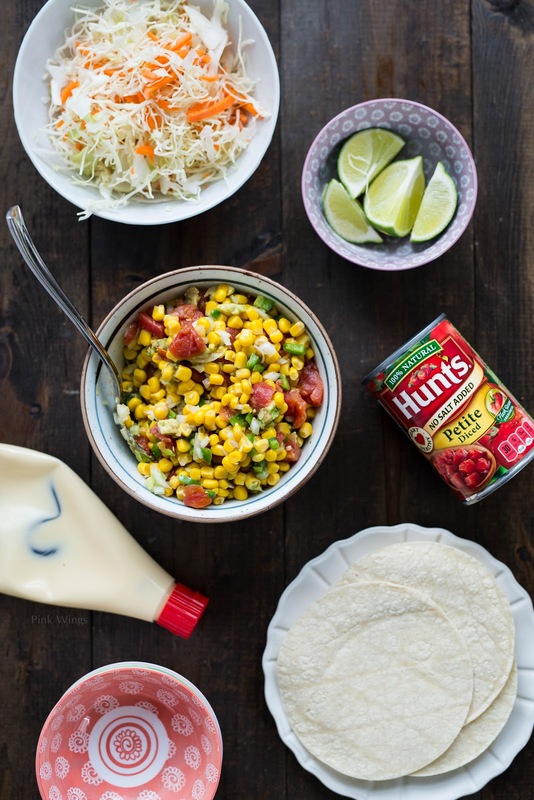 This corn salsa is one that we make for a lot of Mexican dishes because it is perfect as a dip, filling and topping, and I almost always keep the ingredients on hand in my pantry. 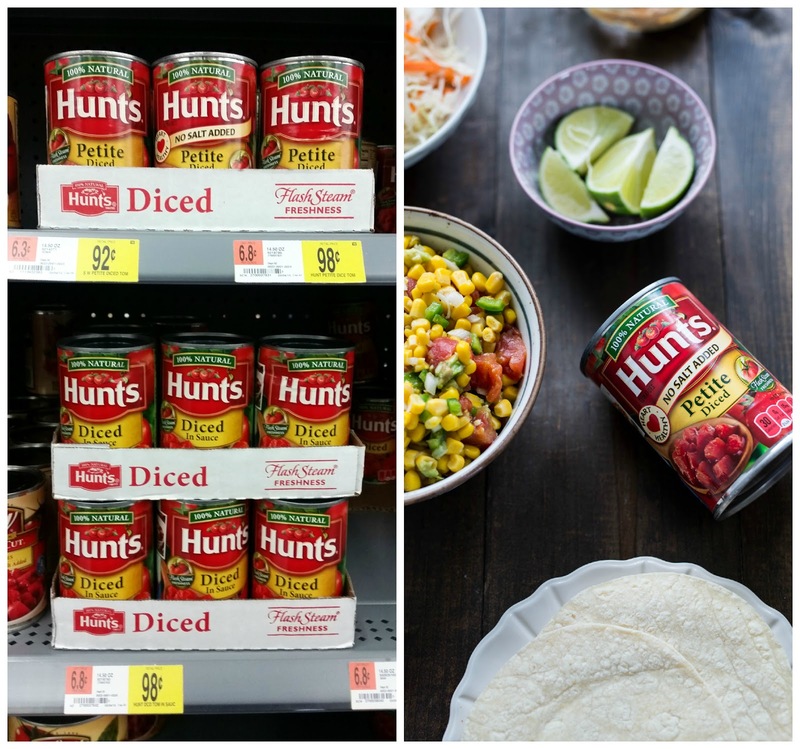 While I was grabbing everything at Walmart this time I noticed that there is a coupon there for Hunt’s tomatoes on Ibotta if any of you use that app. That’s what I used for my salsa and it turned out delish. Also there are more delish salsa recipes at the Hunt’s social hub, so check that out. Do you guys have any favorite salsas? Use a strainer to drain the can of tomatoes and gently rinse. Combine all ingredients. Bake fish according to directions. Mix together mayo and fish taco seasoning and set aside. 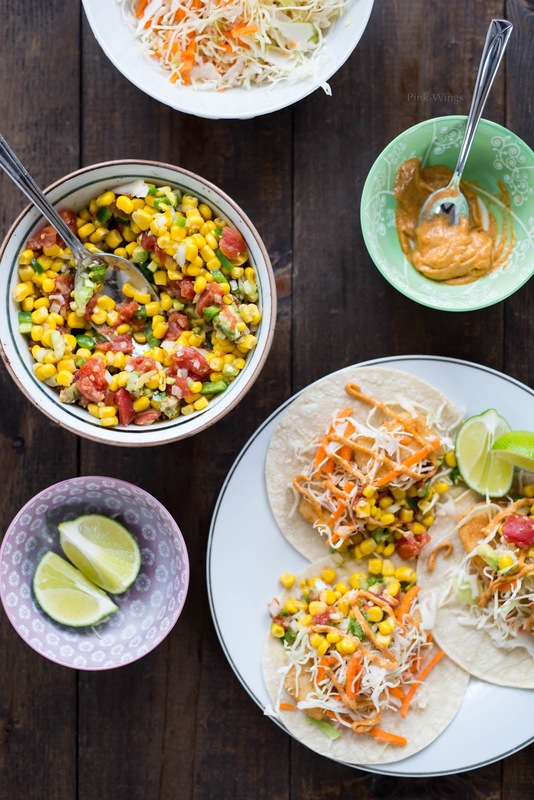 To assemble: warm up your tortilla for no more than 10 seconds, place fish on top, then coleslaw, then corn salsa, and drizzle sauce over the top. Enjoy! Fish taco recipe inspired by Lauren’s Latest. Haha thank you! Tell me if you do! Oh I hate deep frying too. Not just because it feels like a splurge that should be saved for outings, but because it makes both me and the house smell! The fish I use are frozen ones from Trader Joe's and I think they are pre-fried, but they are yummy <3 And thank you! Thanks! I have our camera info on my About page, we love them a lot! Thanks Paige! Love your shrimp taco recipe! Yeah it makes it so easy! Thanks! 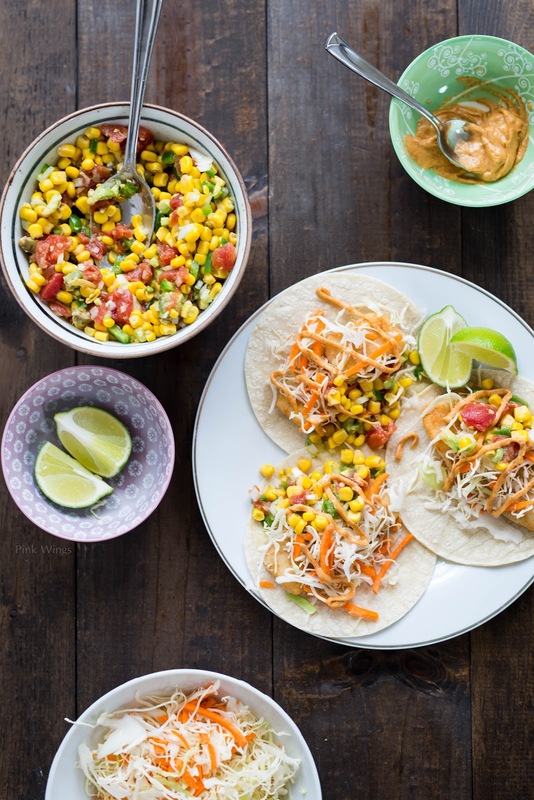 We are planning on hosting a taco party in the upcoming weeks to celebrate the arrival of the warmer weather (I think. . .because after a tease it has somehow disappeared). Regardless this will be perfect for the party and for everyday meals as the hubby and I have been making an effort to eat more fish. wow! I always wanted to make these! So yuummmy! Thanks for the recipe! These looks amazing!!!! I want to try them! These look awesome! I love all the different flavours you've incorporated into the recipe. Looks sooo yummy. Your photos are truly amazing. What camera/lens do you use? This looks so good! Fish tacos are one of my favorite foods definitely, but I hate making anything that involves a deep fry. I need to try this baked fish?? It looks good! By the way, I'm catching up on your posts and they are all so great!! Tacos are so good! Yours look amazing! As always – so GOOD! You are really good at this! 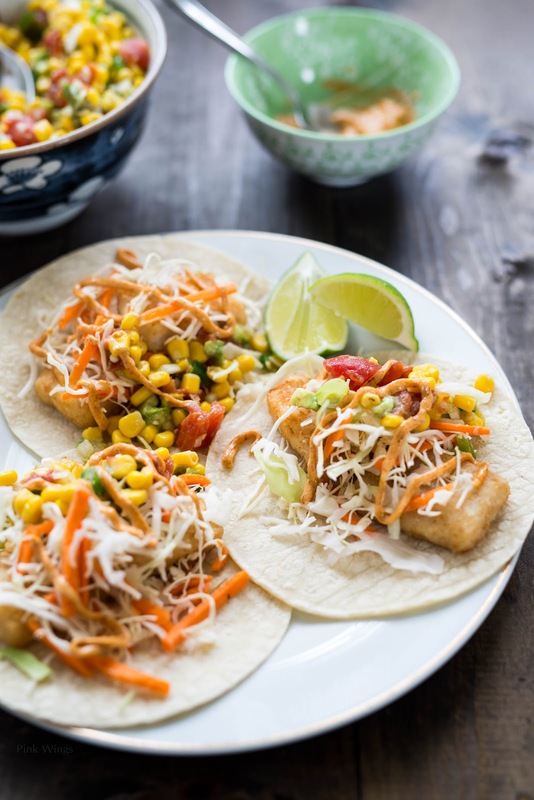 These look so delicious, I gotta try fish taco this weekend. Thanks for sharing. These look super delicious! They're definitely going on next week's menu plan!